LOS ANGELES, California (CNN) -- A one-of-a-kind bicycle belonging to Lance Armstrong that was stolen Saturday, hours after the U.S. cycling legend rode it in a race, has been handed over to authorities, police said Wednesday. 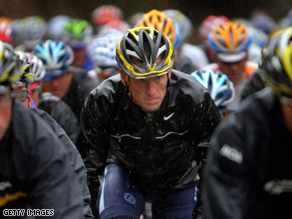 Lance Armstrong's bike was missing after he competed in the first day of the Amgen Tour of California. "A local resident came to the police headquarters and turned in a bicycle that he believed to be Lance Armstrong's," said Sgt. Norm Leong, a spokesman for the Sacramento Police Department. By checking the serial number, "we were able to confirm that the bike was, in fact, Lance Armstrong's bicycle," said Leong, who added that the bike appeared to be in good condition. The man who gave the bicycle to police did not want to be identified, said Leong, who refused to answer questions about how the man came across it. Leong said the man who turned in Armstrong's bicycle "is not a suspect at this time" and did not ask about a reward offered by Armstrong's team for its return, he said. The bike is one of three believed to have been stolen Saturday from a trailer used by Armstrong's team, Astana, while the trailer was parked behind a Sacramento hotel, Leong said. The bikes disappeared hours after the first stage of the nine-day Amgen Tour of California, in which Armstrong and the team are competing. The two other bicycles, which belong to members of Armstrong's team, still are missing. Police have information "that we're not putting out at this time" about a suspect or suspects, Leong said. Officials initially said four bikes were stolen, but one of them was discovered Tuesday to have been misplaced in a storage room in the hotel, Leong said. Armstrong's bicycle, painted a distinctive black and yellow, "would be hard to sell," Leong said. The bikes that disappeared were the first ones within reach of whoever opened the trailer, which held many more, Leong said. The California race is another step in Armstrong's comeback from a 2005 retirement. Armstrong, a cancer survivor and seven-time Tour de France champion, kicked off his return to professional racing last month at Australia's Tour Down Under. Armstrong announced the bike theft on his Twitter account Sunday morning and posted a photograph. "There is only one like it in the world therefore hard to pawn it off. Reward being offered," he wrote. The 750-mile Amgen Tour of California ends Sunday. Armstrong, 37, said he is aiming for another Tour de France victory this summer. He also has said he is not trying to win the Tour of California but is riding in support of teammate Levi Leipheimer, who has won the race twice and leads this year's event. Armstrong was in fourth place Wednesday. Armstrong's comeback is not his first. He stopped racing in 1996, when he was diagnosed with advanced testicular cancer that had spread to his lungs and brain. Doctors have him less than 50 percent chance of survival, but after treatment, he returned to cycling in 1998. He won the Tour de France -- cycling's premiere event -- every year from 1999 to 2005.